Hello Maddis Heroes, last year we sold close to 500 Tshirts. This year he hope to break that mark. We are already well on our way and have sold 150 already with about 3 weeks to go. This is also the first year we have female tank tops as an option (limited amounts) for only a minimum donation of $23. The first batch of tanks was sold within days. A 2nd batch was ordered and will be here by the weekend. Order your while available. Kids / Youth sized T-shirts are also available for only $16. 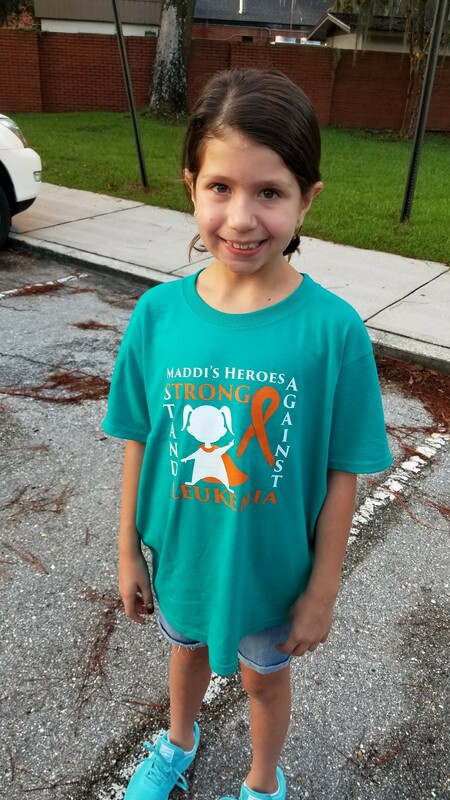 Please head over to the store part and order your shirt now and show of your Maddi's Heroism. All Shirts are in a shade of teal, but have slightly different color. We also have leftover stock from 2017 Maddi's Heroes Shirt for $12 as long as available. THANK YOU FOR YOUR SUPPORT ! ! ! First of all, if you're taking the time to read this, thank you. I'd be lying if I didn't say that this year's Light the Night walk doesn't carry a lot more importance to me than the last two years that I've been involved. 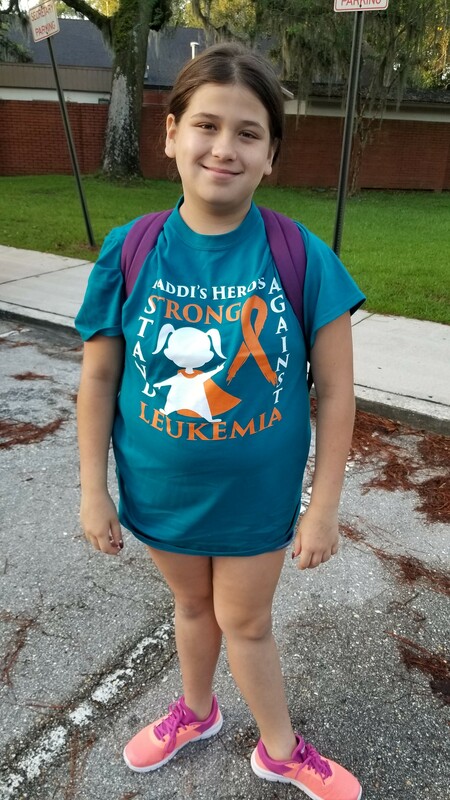 After all, after the trauma that we've been through, I carry a lot of pride in the fact that the Leukemia & Lymphoma Society has chosen Madison to be the "Girl of the year" for the 2016 Jacksonville walk. I feel a burning need again this year, to make a difference and use our pain as a message of HOPE and AWARENESS. Two years ago when I fund raised and walked, Madison was still in chemo treatment. Last year, her treatment had ended, and I found myself walking and fundraising for a different reason. I'd had time to exhale a little, to watch new parents enter this battle, and to reflect on what my role is in turning our traumatic experience into "something good". I've decided that it's time for me to bear my heart and to answer those questions of: "How did you get through it?" "Is she all better now?" I've also decided to address the comment that's been made to me so many times: " I don't know how you did it. I can't imagine. I know I could never go through what you've been through." 1.) How did you get through it? The short, honest answer is: I have NO clue. I honestly feel like I didn't do that great of a job. I shut my emotions off, I held back my tears when any mother with a heart would have let them flow, and I avoided staying overnight at the hospital with her as much as possible. My husband would stay with her overnight. The beeping of machines, the crying and feeling helpless to help her was too much for me. I was there plenty. I just couldn't see her in a cage with wires everywhere at night. I was there many times, laid her on an operation table more times than I can remember. I just couldn't do the night. Her dad was my backbone. I'd say, "What if it comes back?!" He would say: "It won't." I'd angrily say: "How do you know that?!" He'd answer: "I just know." Somehow, this helped me. He believed (or pretended to). Somehow this helped. 2.) Is she all better now? The short, honest answer is: I have placed my faith in that, "Yes, her cancer is gone." Medically, is there a chance that it could come back? YES. That's WHY I fund raise for research. With her diagnosis, the good chromosomes she carried, the type of Leukemia, etc; she has around a 90% chance of remaining free of Leukemia. The fear inside reminds me constantly that she only had a 1 in 3,500 chance of getting it in the first place. That 1 in 10 chance of relapse keeps me fighting. Even if her Leukemia never comes back, she has a much higher risk for a host of other problems down the road. To name a few: learning delays, stroke, infertility, growth and hormone delays, bone problems, secondary cancers and of course, late relapse of leukemia..... just to name a few. So, is she all better? I have NO clue. I hang on to my belief, family, other cancer parents, prayer. 3.) " I don't know how you did it. I can't imagine. I know I could never go through what you've been through." Of course you don't. Neither do I. I couldn't have imagined going through being told my child had cancer and over two years of treatments and a forever changed life, for her, us, our entire family. My thought on the statement of: "I know I couldn't go through what you've been through!" Well..... I wasn't given the option. If it were you, and those words came out of your child's doctor's mouth: "Your child has Leukemia.".... you'd freeze, cry, deny.... but you'd find your way through it. You wouldn't say: "Well, keep him/ her. I'm not cut out for this!" You'd do it, go through it, and come out a changed person. You'd come out with a larger heart for others suffering around you. You'd learn that the things you thought were of utmost importance were really nothing but desires/ wishes/ selfish "I wants". I stil hate a messy house and still want to be the best at my job. These things don't equal "life or death". I rather hold my daughter under a bridge than live in a mansion without her. Trust me, not given the option, you'd do it. My daughter, Madison, a.k.a. "Maddi", was diagnosed on September 20th, 2012. I can remember that day perfectly. I remember what I was wearing, what the weather was like, and what "I thought" the doctor would find wrong with her when I took her for that doctor's appointment I had scheduled. I WAS wrong. They saw troublesome signs of leukemia and we were sent to have stat blood work. The technician called me back within an hour of drawing her blood and said that the doctor was requesting that we go downtown to Wolfson's Childrens Hospital and have her blood redrawn. We had a confirmation of leukemia and were admitted that night. She went in for surgery the next day. She had a bone marrow biopsy, a port placed in her chest, and received her first dose of spinal chemo. How I cope is giving back and making a difference. Would I go back and change it all and not care or be aware? Selfishly, "maybe". Another option that's not mine. When we look at your Facebook feed, we scroll past the sad stuff, religious stuff. We look for the gossip or the jokes. Trust me, I scroll past a lot of it to, which is why I said in the beginning, "If you're reading this: "Thank you". My reality now is: Every 5th or 6th post on my Facebook feed is a post about a child sick with cancer or a child that is on their death bed or requests for prayers because someone's child has just died. Some I know, some are local, and some are new to cancer forums. I NEVER get away from this reality. I have chosen to accept what I cannot change and am changing what I can. I don't have the option of scrolling past it anymore. My heart is forever changed. I hope that this reaches someone who needs this. I sure needed to share it.